Hi All! And a Very Happy Friday to you! Hope you all have had a Fabulous week so far. I took a bit of a break from stamping and posting this week, at least as compared to last week, lol.. I went and spent some time with my BFF up in San Jose, we had a blast as always.. 8-) Well today I'm back with my latest creation... Does anyone out there in blogland keep a binder full of card ideas that you eventually want to create or make a variation of.. Well I have 2 of them, completely chocked full, lol. I now however, keep these types of crafty ideas on my Pinterest boards.. So now I only print them out when I intend to actually sit down and create them! Gotta Love that! 8-) Well, this particular card is one of the ones I stashed away in one of my Binders and have completely CASED it! lol..
Hope you all have a Wonderful Friday & thanks so much for dropping by! Gorgeous Shannon! That embossed heart looks stunning! Beautiful! I really like the layered stamping. I'm pinning this one. Wow! this is gorgeous Shannon! Some fabulous Stamping that you've done here!! I love the white heart, with the gorgeous embossing it looks like embroidery! really stunning card! WOW! BEAUTIFUL! Love this one Shannon...........and yes, I have two binders chock full of ideas....now I just need the time to go back and look through all of them! Wow! What a gorgeous way of using an open-detailed heart! I have some of their limited edition hearts from some years ago, and am looking forward to utilizing your technique with them! Thanks for sharing your ideas, Shannon! Shannon this is quite beautiful!! 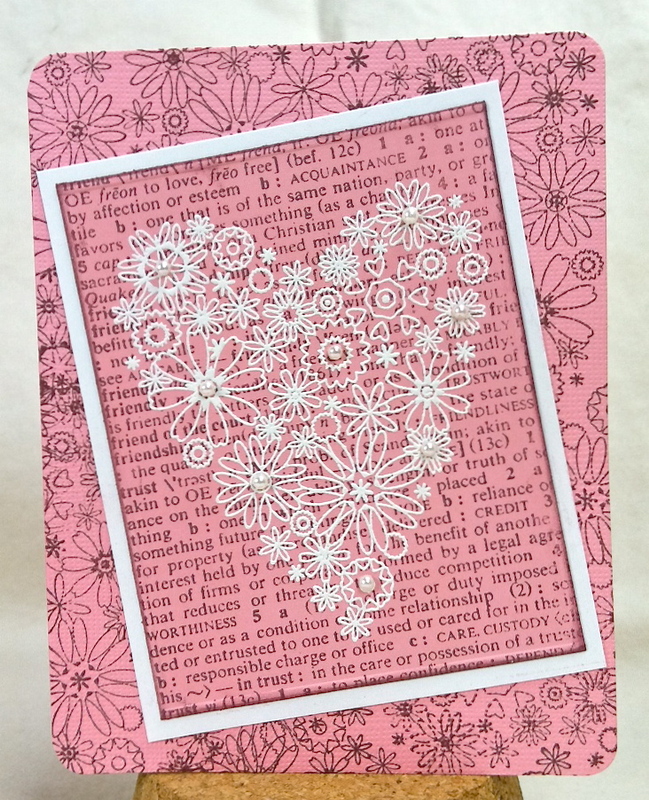 I love the quite embossing with the little pearl centers!! Wow! The embossed heart looks like a lace applique! And it looks completely different, yet wonderfully coordinated on the background panel. This is awesome! This is gorgeous!! Love the heart...actually all of it is gorgeous. This is really PRETTY, Shannon! LOVE the embossed heart on the text with the flowery background! So Sweet! I love the background around the bunny! I love this - very artistic and original. This is very attractive Shannon! !